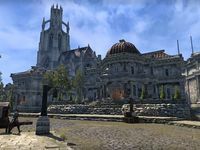 Anvil is a major settlement on the Gold Coast of Cyrodiil. The city was taken by Governor Fortunata ap Dugal and her Red Sails pirates and was declared a free port. Anvil now claims dominion over the entire Gold Coast as a sovereign state. This is contested by Kvatch to the east, which still maintains Imperial loyalty despite the Empire's collapse. A Bounty Board in Anvil offers daily delve quests. Anvil Wayshrine can be found on the western side of the city docks.